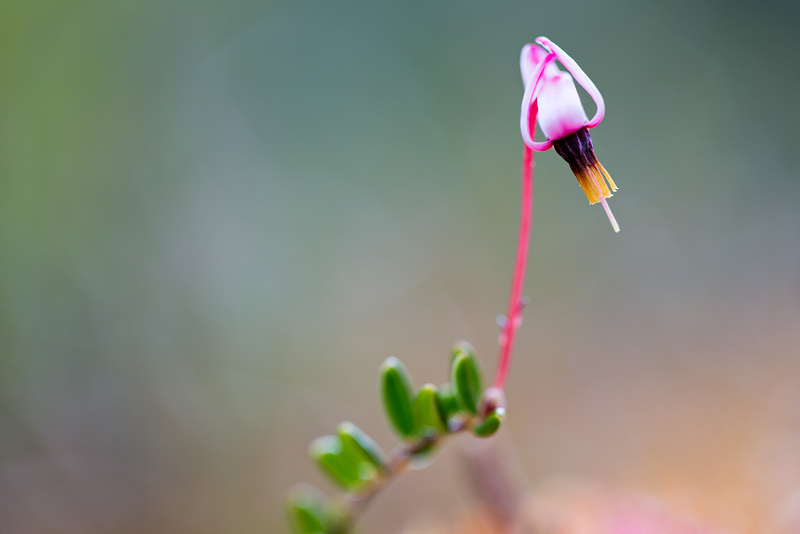 Scientific Name(s): Vaccinium oxycoccos L.
The diminutive bog cranberry or small cranberry is wide-ranging across northern Europe, Asia, and North America. As one of its common names implies, it is a species of bogs–and also fens, muskeg, and arctic-alpine tundra. This photograph was taken in British Columbia’s Pure Lake Provincial Park. It was a “belly picture”, as the shoots of this trailing shrub rarely extend more than 30cm (12 in.) above the sphagnum moss it is often associated with (in this case, this plant is perhaps 15cm (6. in) above the moss). I always am careful about my impact on other surrounding plants when on the ground like that. I find that (dry-ish) bogs are among the easiest to avoid crushing plants (along with sand dunes and large bare rock surfaces), thanks to the soft mossy layer that will sometimes exclude any other plant in large patches. I will also admit that it is exceedingly comfortable to lie in a bed of sphagnum moss with some sunshine and a bit of a breeze while photographing (and perhaps napping). The fruits of Vaccinium oxycoccos are smaller than those of the cultivated cranberry; “cute” isn’t a word I normally use, but the little red berries nestled in sphagnum are…cute. Like the cultivated cranberry, the fruits are edible and can be used in preserves. What a nice picture of this plant, which is growing in nearby (from Luxembourg) Belgium “Haute Fagnes” in the “Moorlands” there, quite rare. Lying on a bed of Sphagnum is another good idea, I will try it next time, and hope to survice! We’re so lucky there are some people willing to endure sunshine and a bit of a breeze in sphagnum moss to capture these photographs for us. LOVE this photo and flower! Definitely worth the belly crawl! Who knew what the cranberry flowers look like! I wonder if one could see the cultivated flowers down at the bogs on the Long Beach Penninsula? are those what are known as lingonberries? I think lingonberries are Vaccinium vitis-idaea a close relative. Here in Alberta we are working with both species for inclusion in reclamation programs of oil sands disturbances. Any graphs of percentages ?? Any effect on CO2 ? But, sure, let’s keep bog cranberries growing. Another fantastic photo. Thank you. I am rereading the botanical mysteries by John Sherwood. If you haven’t read them, start with the first one – Green Trigger Fingers. When I first saw the flower, I thought it must be a freaky variety of Dodecatheon.